Today while walking to the Wiehe-Reston East Metro station I noticed a VDOT contractor dumping snow on the Wiehle Ave trail leading to the station. The same crew had just blocked a previously cleared trail on Sunrise Valley Dr leading to the Wiehle trail. Reston Association crews have been out clearing most of the 50 miles of Reston trails only to have VDOT crews block them. Reston Association has budgeted funds to maintain their trails, including having a fleet of snow plows. Fairfax County needs to figure out how to make areas around Metro stations and schools safe for their residents. The first photo shows the once cleared trail on Sunrise Valley Dr. The next photo shows the front loader dumping huge piles of snow on the Wiehle Ave trail. At the entrance to the Wiehle Station at Reston Station Blvd and Wiehle Ave, the Wiehle trail is blocked and I saw two pedestrians walking in the road in the short time I was there. The Lake Thoreau trail along Sunrise Valley Dr was cleared by Reston Association crews earlier this week. Today the VDOT crews blocked it, which has happened multiple times in the past. The Lake Thoreau trail near South Lakes Village Center blocked by snow from the road. This trail was passable earlier. I was forced into busy South Lakes Dr to get around the pile. Update 30 Jan: The same situation occurred in West Springfield as reported by NBC4 in their story Plow Crew Dumped Snow Onto Cleared Sidewalk in VA. After a resident notified NBC4 about the problem, VDOT crews were out to clear the sidewalk. That was Greeley Blvd that is a two lane road. The snow being cleared was for on-road parking. VDOT must have lots of money to clearing free on-road parking; maybe that money should be used for major transportation trails. 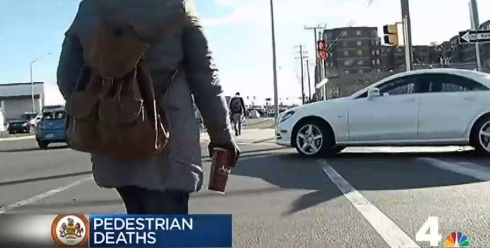 Today Greater Greater Washington published Pedestrian deaths tripled in Fairfax County. Bad road design didn't help. The article references an NBC4 report on the topic, including footage of the Gallows/Route 29 intersection near the Mosaic District. The footage also shows a motorist running a red light when turning right and you hear another motorist honking at a pedestrian crossing in a crosswalk. The report was filmed before the big snow storm; conditions are much worse out there now. See our earlier report about a walkable Mosaic District. 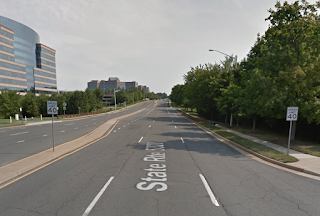 Eleven people on foot died in crashes in Fairfax County in 2015. That continues a rising trend since 2012, when the number was just four. What's going on? NBC4 reporter Adam Tuss talked to some people about what's going on. A leading hypothesis in the story is that more people are walking around. That seems likely, but one element is missing: how poorly Fairfax's roads are designed for walking. A number of people in the story talk about newcomers. One driver says, "I definitely worry about people who aren't from here," who try to cross when they don't have the light or not at a crosswalk. The subtext sure sounded like, "... people aren't familiar with the way we haven't designed roads for pedestrians in Fairfax County." Just look at this intersection where Tuss is standing, the corner of Gallows Road and Route 29. It's about 0.6 miles from the Dunn Loring Metro station. And it's huge. If you've tried to walk or ride anywhere in the county you know that VDOT and Fairfax County do not clear snow from sidewalks and trails. To make matters worse, VDOT snow removal crews usually dump huge piles of snow at the intersections, forcing pedestrians to walk in the road. Fairfax County does not have a sidewalk/trail snow removal policy. The Board of Supervisors has discussed the issue many, many times. They've held snow summits. What's the outcome of all this talk? A web page that tells residents to Take Your Snow and Shovel It. While we agree that it's good to encourage residents to clear snow from sidewalks, this is not a very impressive outcome of all the talk. It seems that every time it snows lately, the excuse is that it's a once in a lifetime storm and the county and VDOT can't be expected to make it safe for pedestrians and cyclists to get around. We don't accept that anymore. Maybe there should be a moratorium on transportation spending for new projects until the state and county can figure out how to maintain our existing infrastructure. We also need a snow removal ordinance. Arlington and Alexandria require residents to clear snow on their sidewalks and the county needs to do the same, with exceptions for those who physically can't remove the snow and a county-organized volunteer program to help others. In a recently published study by Boston University researchers a survey of 89 US mayors of medium and big cities (populations over 100,000) showed that these public officials express strong support for bike-friendly policies and bicycling infrastructure. Not surprisingly, however, aging and underfunded physical infrastructure was the most pressing challenge the mayors faced, and these problems continue to outrank bicycling, pedestrian, parks and recreation needs in the cities’ funding priorities. 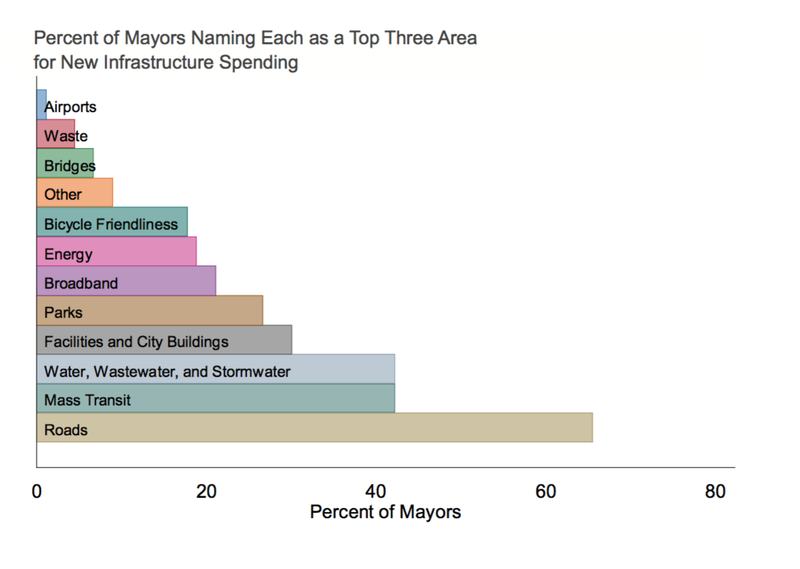 The study explains that “big ticket” infrastructure needs, including roads, mass transit, and water, wastewater and stormwater infrastructure, dominate the mayors’ plans and efforts. three areas you would prioritize if you could allocate a significant amount of new money? 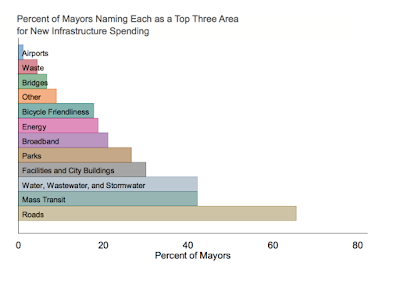 Still, when asked to name more modestly priced infrastructure priorities, bike and pedestrian infrastructure and parks were the most frequently cited by the mayors. 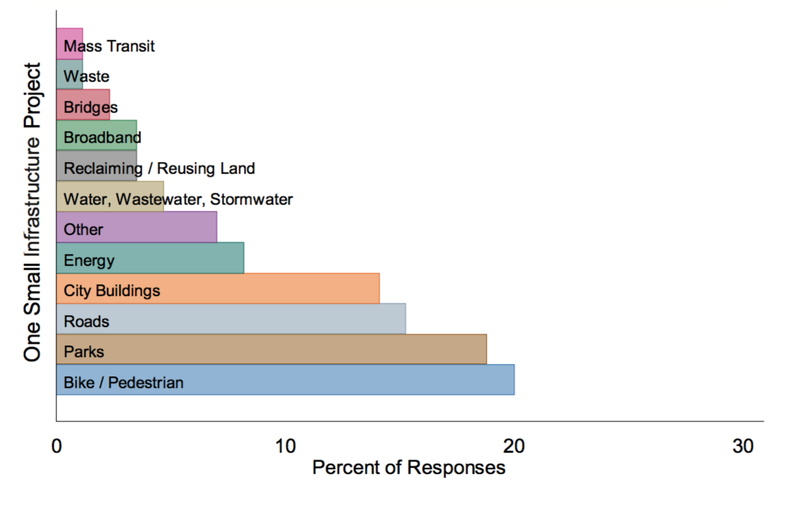 According to survey, the mayors included bike-friendly policies with biking infrastructure as funding priorities. Figure 5: Please think about “small” infrastructure projects. That is, projects with costs equal to a small portion of your city’s annual capital budget. If your city were given an unrestricted grant to pay for any ONE such “small” infrastructure project, what would you spend it on? As encouraging, 70 percent of mayors support improved bike accessibility, even at the expense of parking and driving lanes. A mere 15 percent disagreed or strongly disagreed. bicycles even if it means sacrificing driving lanes and/or parking. The study points out that as cities grow and national governments devolve new powers to local officials, mayors and other local leaders have become increasingly important in the U.S. and around the world. FABB continues to advocate strongly with Fairfax County officials to help keep the county in step with what other areas are doing in developing the adaptive policies needed to make urban and surrounding suburban areas more connected and more economically successfully, healthy, and livable. Today we drove by sections of the W&OD Trail in Reston. At Old Reston Ave (first photo below), looking west, it looked like a snow plow or blower had made a pass up to Old Reston Ave. To me this looks like the tracks of a Reston Association plow. Maybe they were just using the W&OD Trail to get from Reston Parkway to Old Reston Ave.
As you can see below, to the east there were only footprints in the snow with a pile of snow at the trail entrance. The next photo was taken at Newton Square looking west. Someone had cleared a narrow track on the short stretch of trail from Newton Square to the next service road (across from BAE). In the photo below, looking east, only one or two tracks of footprints were visible. At Wiehle Ave there was no sign of any plowing/blowing in either direction. The same was true at Sunrise Valley Dr. It's going to be a long time before the trail is passable in Reston. At Sunset Hills Road we saw several people walking in the road, which is very dangerous given that in several areas only one lane in each direction is clear, which was true for most four lane roads. Most intersections had mountains of snow blocking the trails and sidewalks. Gary McMullin regularly commutes from his home in Fairfax to the Burke Centre Virginia Railway Express station. 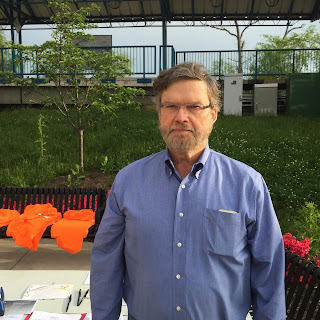 When he spoke to FABB on Bike to Work Day Gary said he rides for the exercise and the pure enjoyment of biking. Gary told FABB that the thing he likes most about riding is how relaxing it is. He added, however, that more bike paths lanes would make riding safer and even more relaxing. 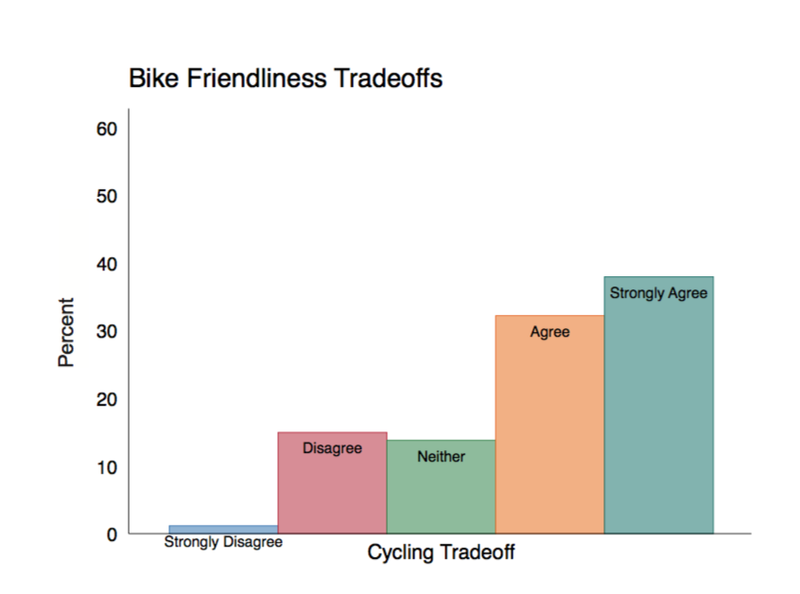 FABB agrees—and studies show—that better bike infrastructure helps overcome safety concerns that discourage many people who would like to ride bikes. European cities that provide significant infrastructure for the bicycling transportation alternative have demonstrated that when cycling feels safe, especially for children and the elderly, more people ride. And, these European cities have shown that as the roads become safer for cyclists, there is less danger for motorists and pedestrians. 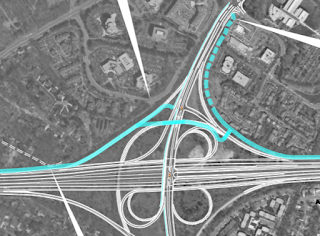 VDOT recently released the I-66 Outside the Beltway Tier 2 Environmental Assessment (EA) documents. The project includes a major regional trail parallel to I-66 from Gallows Road to the Fairfax County border as well as new bike and ped facilities on rebuilt bridges. We are asking cyclists to contact VDOT by February 4 to support bike access along and across I-66. Please reference "I-66 Tier 2 Revised EA" in the subject. See the Fairfax County portion of the Parallel Trail map. 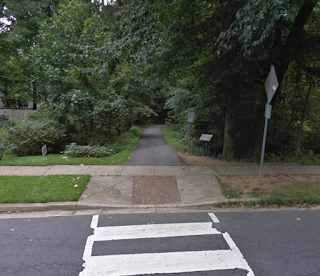 The trail would extend the Custis Trail located inside the Beltway. See the FABB I-66 Info Page for other supporting documents. The Federal Highway Administration requires the preparation of an EA when VDOT conducts a significant project like the expansion of the I-66 corridor. According to the document, "This Tier 2 Revised EA is being made available for a 15-day public review and comment period. All comments received on the Tier 2 Revised EA will be considered and substantive comments will be addressed prior to finalizing the Tier 2 EA process and prior to a Tier 2 NEPA decision by FHWA." Comments are due February 4. From VDOT: "Submit your written comments on the Tier 2 Revised EA by February 4, 2016 to Ms. Susan Shaw, PE, by email to Transform66@VDOT.Virginia.gov or via the online comment form on the project's website or join the discussion. Please reference "I-66 Tier 2 Revised EA" in the subject line for all correspondence." Earlier VDOT released the Requests for Proposals that included Technical Requirements which contained proposed locations where the parallel trail can be accessed from adjacent neighborhoods. We will post our analysis of those points soon. Accommodating bicycles strategically along and crossing the I-66 corridor could provide substantial benefits to the transportation system, benefits to the environment, and improvement to people’s quality of life. Bicycling is a healthy, efficient, and affordable transportation alternative. It can dramatically enhance people’s access to transit and related facilities, connect neighboring communities, improve people’s health, and reduce people’s reliance on a personal automobile for short and moderate-distance trips. Fairfax County and Prince William County have invested substantially in bicycling infrastructure, and along with transportation-related associations, the counties have also invested in programs to encourage and expand bicycling. Currently, I-66 is a barrier to bicycle network connectivity in many locations outside the Beltway (I-495). The modification of bridges, ramp termini, the freeway mainline, and some local roadways offers the opportunity for bicycling networks along the corridor (existing and planned) to become better connected. Folks who ride a bike to work will tell you that there’s simply no better way to commute. It’s often the fastest way to get to work, it offers a wide array of route options, and, unlike driving or taking public transportation, doing it regularly is actually good for you. But the numbers from Capital Bikeshare tell a stark, though not shocking, story: People ride to work much less often in the winter. Even as peak usage in warm months has climbed from about 140,000 in 2011 to over 360,000 last year, January or February usage has remained around 110,000. Of course, those numbers don’t reflect people who own their own bikes and who might be considered more dedicated to cycling and likely to ride when the weather gets cold. However, the most recent annual report by Strava, a popular fitness app for cyclists and runners, also showed that bike rides classified as “commuting” declined 63.3 percent in the winter. Happy 2016! We hope everyone is staying warm on their bike rides over the past few days; very different than the shorts weather we experienced over the holidays. I'd like to take this opportunity to give you a quick update on FABB’s plans and activities for 2016. During 2015, FABB embarked on a path to change its status from a sponsored project of the Washington Area Bicyclist Association (WABA) to an independent non-profit. As part of that process, the decision was made to rename FABB the Fairfax Alliance for Better Bicycling, to reflect our goal of building an even stronger advocacy organization. FABB’s increased focused on alliance-building fulfills a need to take advantage of the combined strength of Fairfax County’s many other bicycling focused organizations to achieve our common goals by enhancing our collaboration with County government as well as the private corporations that show a rising interest in supporting bicycling. We are still in the process of filing the applications to be granted 501(c)3 status, so changes to FABB’s activities and the effort to publicize our new status and goals will occur gradually. We are extremely grateful to WABA for sponsoring FABB over the past several years and look forward to continue working with Greg Billings and his team to promote better bicycling throughout the Greater Washington region. Bruce continues in the acting Executive Director role but expect to see a very active and engaged Board of Directors. However, we can't do this alone and are eager to engage more Fairfax cyclists and bicycling supporters than we have in the past. To improve this outreach FABB will be rotating its monthly general meetings among each of the Supervisor districts in Fairfax County. With the FABB Board now handling organizational “housekeeping”, our goal is to sharpen the focus of FABB meetings and make them more interesting and useful by discussing advocacy opportunities related to the district hosting the meeting along with other topics of interest to area cyclists and cycling advocates, such as VDOT meetings and Fairfax Board of Supervisors actions. Mosaic Community Space in the Mosaic District. (Directions below). We will keep this meeting to three topics: (1) an open discussion with citizens about Providence district issues, (2) working w/ a consultant to engage those in attendance in creating a promotional video about FABB and (3) a quick discussion of FABB's 2016 goals. Please join us afterwards for a beer at nearby MatchBox around 8:45pm to toast recent cycling related successes in Fairfax - like Tuesday's announcement of Capital Bike Share coming to Reston AND Tysons. Be safe and see you on Wednesday. Directions to the Mosaic Community Space: Located near the intersection of Gallows Road and Lee Hwy. Coming from Lee Hwy, head south on Eskridge Rd then turn left on Merrifield Town Center and continue past Brine and DGS Deli to a right on Merrifield Cinema Dr. The meeting room is located just around the corner. See the map of FABB Meeting Room Locations. If you have problems finding the room you can call 703-328-9619. 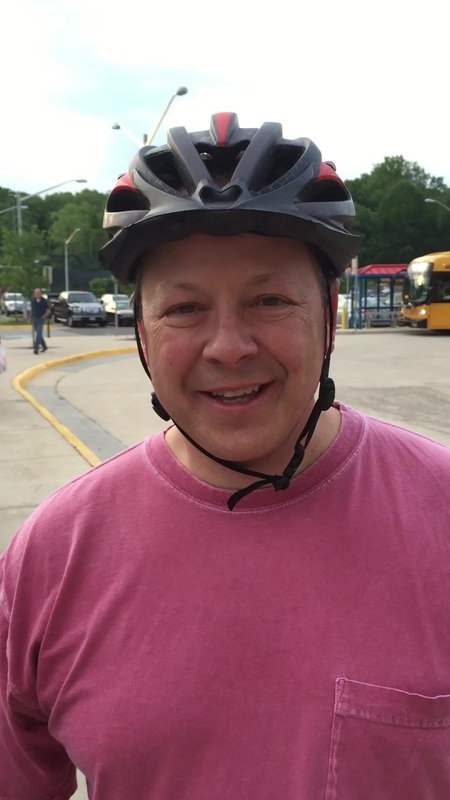 On Bike to Work Day 2015 Christopher Anello talked to FABB about his biking habits and views. 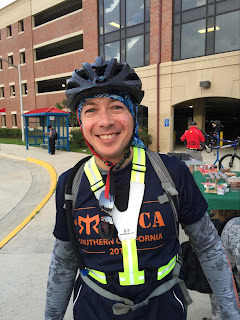 Christopher said he mostly rides from his home in Fairfax City to the Burke Centre Virginia Railway Express station as part of his daily commute. He travels by bike to avoid driving (and to avoid adding to the region’s hydrocarbon pollution) but also because he finds his rides a fun way to start and end his workday. Asked what he most likes about riding, Christopher said he enjoys the exercise, is glad to help protect the environment, and appreciates that his bike commute is relatively fast in comparison to driving on the region’s clogged highways. He would like to see more bike lanes in Fairfax County to make riding less dangerous. Yesterday Northern Virginia Regional Commission (NVRC) released an interactive map of pedestrian and bike crashes from 2012 through November 2015. 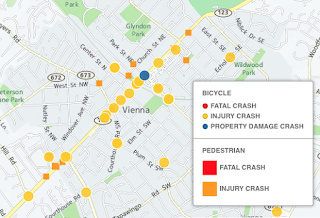 Clusters of bike crashes occurred along major roads such as Routes 1, 7, 50, 123 (especially in Vienna), 236, and 237. Several crashes occurred in the Merrifield area, including two pedestrian fatalities, highlighting the importance of providing good bike and ped facilities in a rapidly growing area round the Dunn Loring Metro station. Only one bicycle fatality is shown, on Columbia Pike, where Elizabeth Shattuck was killed. Not shown was the location where Andrew Gooden was killed on Sunrise Valley Drive in Herndon which occurred on August 31, 2015. The data were also used to create a heat map. The Northern Virginia Regional Commission (NVRC) has released an online map indicating the location of bike and pedestrian injuries, fatalities and property damage throughout the region for calendar years 2012 through mid-November 2015. In total there were 3238 incidents that either led to an injury, property damage or fatality. Specifically, there were 3116 injuries, 95 fatalities and 27 instances of property damage. The data for the maps was provided by the Virginia Department of Motor Vehicles. View the map with each incident plotted. View a heat map of the region plotting these incidents. Today the Board of Supervisors approved $1.7 million for bike sharing in Reston and Tysons. We were very encouraged that Tysons was included in the most recent plan. 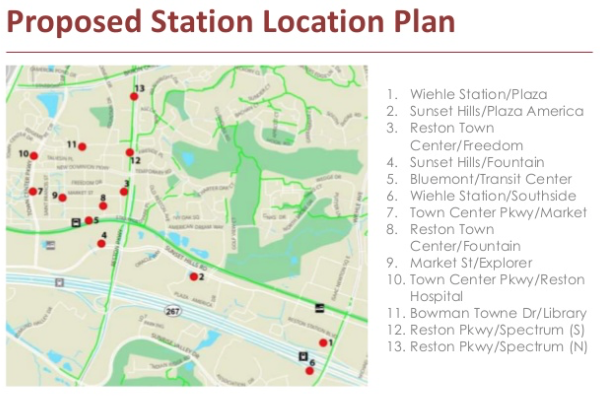 In Reston the county has been moving forward with bike station planning and preparing to purchase the stations and bikes. While FABB has promoted bike sharing in Tysons and bike sharing was recommended in the Tysons bike plan (p. G-3), but we expected it would be implemented in a second, later phase. What made this happen was Tysons Partnership stepping forward to make a "financial contribution to the initial capital cost, as well as operating costs." 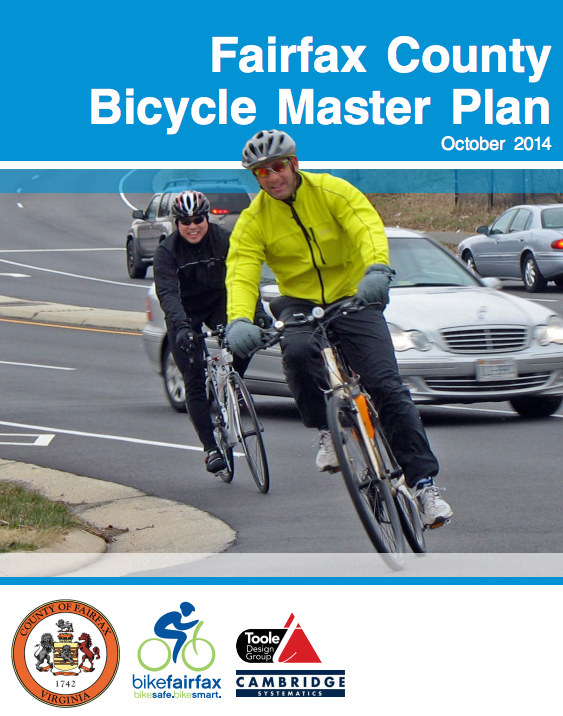 This is great news, especially now that there are over 2 miles of new bike lanes in Tysons. Thanks to Fairfax County for having the foresight to implement bike sharing, and to Tysons Partnership for their sponsorship. See a FABB blog article a presentation by Charlie Denney of Alta Planning about bike sharing in Tysons. From the the county news release Fairfax County Approves Bikeshare System for Reston, Tysons. The Board’s action comes just one month after the approval of 31 pedestrian and bicycle projects in Herndon and Reston, and it also supports the county’s Strategic Plan to Facilitate Economic Success. The economic plan calls for creating dense, mixed use communities with many transportation options, and Capital Bikeshare helps to accomplish this goal. Not only do bikeshares attract the younger “creative class” that fuel an innovation economy, but also they produce tangible economic benefits. Also, a 2014 Capital Bikeshare member survey found that its riders make more trips to restaurants and stores than they normally would without the bikeshare system. In addition, an academic study found that 23 percent of Capital Bikeshare riders spent more money because they used the system. In 2014, the Metropolitan Washington Council of Governments (MWCOG) awarded Fairfax County a Transportation and Land Use Connection grant to study the feasibility of launching a bikeshare system. The results of the study showed that bikeshare could succeed as a viable transportation option in Reston. In the summer of 2015, the Virginia Department of Transportation (VDOT), in partnership with Fairfax County, and with the support of the Tysons Partnership, implemented several miles of bike lanes in Tysons. This new infrastructure provoked the idea that a bikeshare system could succeed in Tysons, as well as in Reston. The Tysons Partnership approached FCDOT with a proposal to bring bikeshare to Tysons, and to make a financial contribution to the initial capital cost, as well as operating costs. For more information on this project, contact FCDOT at 703-877-5600, TTY 711 or visit www.fairfaxcounty.gov/fcdot/bike. http://www.capitalbikeshare.com/assets/pdf/cabi-2014surveyreport.pdf , p. v, Jan. 5, 2016.
 http://ntl.bts.gov/lib/51000/51900/51965/VT-2013-06.pdf , p. 22, Jan. 6, 2016. Rose talked to FABB about her love of riding at the Wiehle-Reston East Metro station on Bike to Work Day 2015. Rose: I love the exercise and fresh air, plus it’s a fun activity with my husband. Rose: C&O Canal Towpath, local trails, country roads. Rose: More trails and encouraging other cyclists to give "passing on your left" alerts. 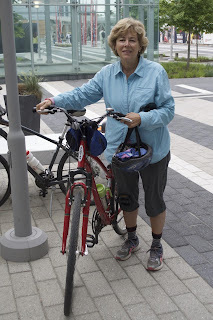 Rose noted that she and her husband often travel around the country and use bikes to explore local areas. Thank you to everyone who donated to FABB this year! We are your local bicycle advocacy group and your donations will go to making Fairfax a better place to bike. A special thank you to Fionnuala Quinn and Skip Bean for their financial support for the Bicycle Master Plan celebration in January. We also want to thank our two corporate donors this year, IMS Health and Squij Kat. This year Squij Kat, a local company that makes bike-specific products, dedicated a percentage of their sales to be donated to FABB. When you Celebrate Cycling with Squij Kat you know that a portion of that money will go to FABB. We have a long list of goals for 2016 that the new FABB Board is in the process of finalizing. Those goals include getting funding to implement the Bicycle Master Plan by working with the county to develop a list of project and program priorities, holding FABB meetings in more locations around the county to about your local cycling needs, to continue to monitor the I-66 project, work towards making Fairfax a Bicycle Friendly Community, building an alliance of Fairfax bicycle advocates, and more. Your support is critical to our success. Thank You! 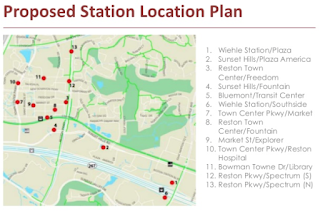 The Fairfax County Planning Commission will vote on plans for the Reston Town Center Metrorail station on Wednesday, January 13. There will be 20 short term car parking spaces, 28 bike racks (56 bikes), and 6 bike lockers at the station. We think there should be more bike parking. Compare the capacity of 62 bikes at the Town Center station to the Wiehle-Reston East station. On the north side, the Charlie Strunk bike room has capacity for over 200 bikes and the free, covered bike room can hold approximately 36 bikes. According to a bike count we conducted at the Wiehle station from July 31 to September 3, 2014, an average of 76 bikes/day were parked on the north side. Bike racks at the Town Center station, surrounded by much more residential and commercial density than the Wiehle station, will like be filled once the station opens. Some cyclists who currently ride to the Wiehle station will want to ride to the Town Center station and since the station is over a quarter mile from the Town Center and major development planned north of there, biking to the station will be an appealing option. 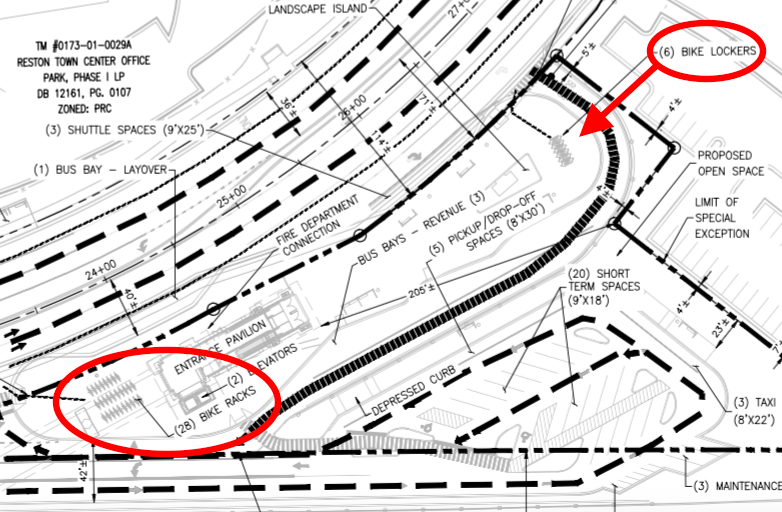 Bike lanes on Sunset Hills Rd, which leads to the station, are included in the Bicycle Master Plan and depicted on the station plan. The bike racks are located near the road so access should be easy, but the details of that access need to be well-thought out, which was not the case at the Wiehle station. Reston Town Center station design, SE 2015-HM-024, PRC 86-C-121-05, 2232-H15-10. Given the success of the Wiehe-Reston East Metro station bike room and free, covered bike parking, I think the RTC station should have more and better bike parking. The Wiehle station has bike parking capacity on the north side of nearly 250 bikes. The Town Center station, surrounded by much more residential and commercial density, will have a capacity of 62 bikes which will likely be filled from day one. According to our bike count at the Wiehle station from July 31 to September 3, 2014, an average of 76 bikes were parked on the north side. If no additional bike parking is provided WMATA should ensure that additional bike parking will be added where the racks are currently located (through a double-decked system), or that racks will be added in other locations. Bike access to the Wiehle bike room was not well planned. 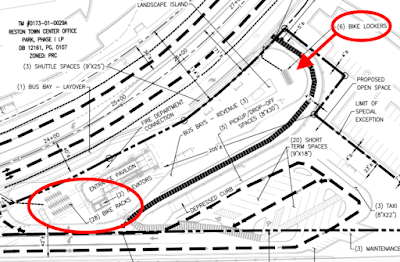 WMATA needs to identify the precise path that bicyclist will follow to the station, provide clear wayfinding signage to bike parking, and reduce conflicts with motorists and pedestrians. The county has funds to begin to implement bike sharing in Reston. It is only logical that a bike share station be located at the Town Center station. It's a long walk to the Town Center and parts north which will be redeveloped soon. There should be a location dedicated to a bike share station at the RTC station. Today Congressman Earl Blumenauer (D-OR) and Congressman Vern Buchanan (R-FL) introduced legislation that makes it easier for federal transit and highway programs to fund bikeshare systems and related improvements. Over the last several years bikeshare systems have expanded throughout the United States. By clarifying that bikeshare projects are eligible for federal funds the Bikeshare Transit Act will make it easier for communities to create and improve bikeshare systems. Making it clear that bikeshare projects and associated equipment are eligible for federal transit funds and FHWA Congestion Mitigation and Air Quality Improvement funds. Fairfax County is considering paving a section of the Long Branch Trail between Woodland Way and Wakefield Chapel Road. An open forum to discuss the project will be held January 12 from 7:30-8:30 p.m. at the Kings Park Community Room located on the second floor of the Kings Park Shopping Center. Fairfax County Park Authority reps will discuss the project and field questions. In October the Park Authority held a similar meeting on paving of the nearby Cross County Trail in Wakefield Park. Strong opposition was voiced by some community members and several mountain bikers. For more info about the meeting see the Friends of Long Branch Stream Valley December newsletter. On Saturday, January 9, Fairfax Co VA legislators will hold a public hearing at the Fairfax County Government Center, 12000 Government Center Parkway, Fairfax, VA starting at 9am. This is an opportunity to support two bike bills that we've heard will be introduced this year. Not passing another vehicle at a crosswalk: Del. Kaye Kory plans to submit a bill that will address the situation in which one motorist is stopped for a pedestrian or bicyclist in a multi lane road. A vehicle approaching in the same direction must not pass that stopped vehicle. Del. Kory introduced a similar bill, HB 320, two years ago. Many crashes occur when one motorist stops, a cyclist proceeds through the intersection, then a second motorist does not stop and hits the cyclist. In 2012 a cyclist was struck while in the crosswalk on Wiehle Ave at the W&OD Trail. There are four southbound lanes and often motorists in one, two, or three lanes will stop but not in the fourth lane, usually the inside turn lane that has a separate green arrow. 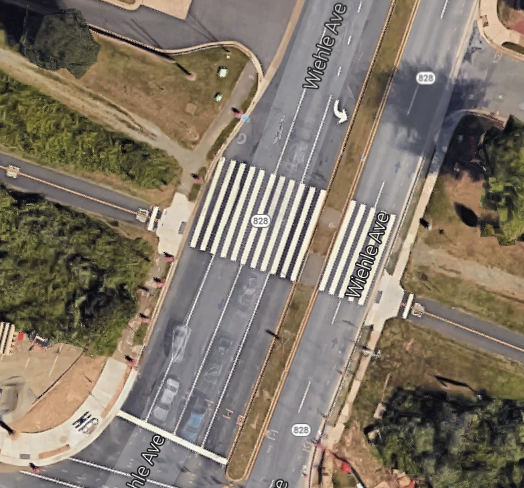 In 2013 a cyclist was severely injured when crossing Sunrise Valley Dr at the W&OD Trail when one motorist stopped and the second motorist continued. We do not yet have bill numbers for these two proposed bills. Click on the link to the sponsor's name to see their sponsored bills, and consider attending the public meeting on Saturday and supporting the bills, or at a minimum, asking Del. Kory and Sen. Surovell about their bills. HJ55 - House Joint Resolution 55 was introduced by Del. Lingamfelter (R-Fauquier & Prince William Counties). "Requesting the Department of State Police to study the laws and policies governing bicycling on state highways. Report." Del. Lingamfelter voted agains the Three Foot Passing bill and the Following Too Closely bill. In conducting its study, the Department of State Police shall consider (i) the policies that govern safe bicycling on state highways and how bicycling on highways may be made safer; (ii) whether certain highways should be restricted to bicycling on the basis of hazardous physical characteristics, traffic flow, speed limits, and visibility of bicyclers by motorists; (iii) any safety-related standards bicyclists should observe that are not currently required; (iv) any additional measures motorists should observe that are not currently required; (v) whether additional education requirements for bicyclists and motorists are needed to enhance bicycling safety; and (vi) effective bicycling safety policies in other states. SB195 - Senate Bill 195 was introduced by Sen. Kenneth Alexander (D-Chesapeake City & Norfolk City). "A BILL to amend and reenact § 46.2-1015 of the Code of Virginia, relating to rear lights on bicycles, electric personal assistive mobility devices, electric power-assisted bicycles, and mopeds." The bill would require all bikes ridden on the highway to have a white front light and a red rear light. Currently rear lights are not required at night unless the speed of the road is 35mph or greater. However, the word "highway" was added to the existing bill which in effect would not require bicyclists to have lights at night if riding on a trail. We will post updates to these and other bills as we hear about them during the legislative session progresses. Our main source for info during the session is usually Virginia Bicycling Federation folks. On August 31 of this year Andrew Gooden and a coworker were riding their bikes home from work as lifeguards in Herndon. Andrew was struck from behind and killed by a Uber driver. The incident occurred on Sunrise Valley Drive just north of Coppermine Road. See previous FABB blog posts about the crash. The road at the crash location is relatively flat, with two lanes in each direction, and the speed limit is 40 mph. There is also a right turn lane where we think the two cyclists were riding. The crash occurred just after sunset. No charges were filed against the motorist. We recently obtained a copy of the report of the crash, known as the DMV form FR300P. We are concerned about some of the information contained in the report. According to the report, Andrew was "overtaking on a hill." According to the other cyclist, Andrew was riding beside him and they were talking. There was no "hill" and Andrew was not "overtaking." Because Andrew was talking, the detective working the case determined that Andrew was "Distracted." More importantly, we are concerned about statements in the crash description, about safety equipment that is not required by law, that imply that Andrew was responsible for the crash. Our comments are in [Bold] within brackets. "Driver 2 (D1) was driving a 2014 Suburban northbound on Sunrise Valley Drive in the right lane. D1 did not see the two bicyclists until just prior to impact. D1 applied brakes, activate [sic] ABS and turned V1 to the left. He struck D2 but not the second bicycle. After impact the operator, Mr. Gooden, was thrown approximately 81 feet from the bicycle and struck the pavement and curb. "V2 is a Huffy Descent Rally mountain bike. The bicycle is owned by his employer Community Pool Services." 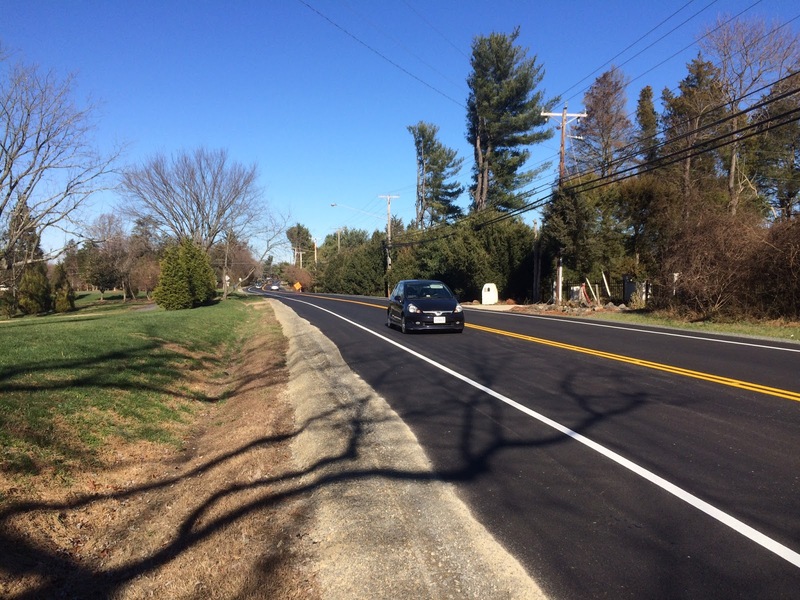 Hunter Mill Road was recently repaved and it now has wider paved shoulders. During the repaving additional asphalt was added to the outer edges of the roadway and now there is an approximately 3-4' shoulder that appears to be rideable. We plan to check it out in the near future. The new shoulder extends from Route 123 north to Lawyers Road. In some areas the shoulder becomes very narrow, mostly at intersections where a left turn lane is located. At those points cyclists would likely have to ride in the main travel lane. FABB has been advocating for paved shoulders on Hunter Mill Road for several years. The road is one of the only connecting N-S roads in this part of the county. The last time the road was paved some additional asphalt was added but not enough to be safe for cyclists. We're pleased with our first look at the shoulders on Hunter Mill Road and will be interested in hearing cyclists' reactions to the new paving. When combined with wide paved shoulders on Lawyers Road from Twin Branches Road, it may now be possible to ride from Reston to Oakton mostly on paved shoulders. Shoulder paving to accommodate bicycle and pedestrian activity shall have a goal of utilizing at least 2% of the district’s pavement budget (pavement asset budget) and shall be accomplished only upon roadway sections that have adequate unpaved shoulder width to accommodate the paving and that shall not require the adjustment of utilities. If less than 2% of the pavement budget is spent, the reasons for the inability of the district to meet the goal must be documented and approved by the District Administrator. See FABB notes from the March 2013 Statewide Bicycle and Pedestrian Advisory Committee meeting where this topic was discussed. Also see info from the State Bicycle Policy Plan. 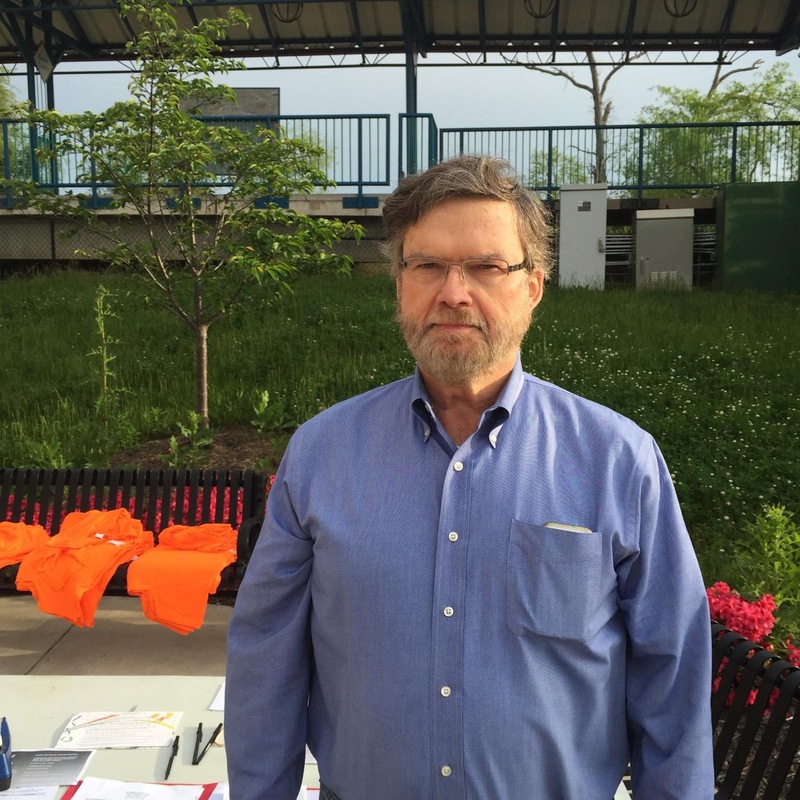 On Bike to Work Day 2015, FABB spoke to Don Curran of Burke and asked him about his biking habits. Don said he generally bikes to work and does it because he enjoys it. He especially likes that biking gives him time to think. As a committed bike commuter who rides in all seasons, Don suggested that keeping the bike paths clear of snow, ice, and debris during the winter would make riding easier and safer. Cyclists can notify VDOT of issues like these by submitting work requests on the myVDOT page or by calling 1-800-367-7623 (FOR-ROAD). VDOT is good about responding to requests for repairs, especially if there is a safety hazard involved.